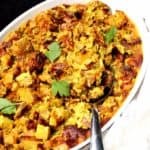 A one-pot vegan Tater Tot Casserole with a creamy, savory filling of veggies and vegan sausage covered by a golden, crispy layer of tater tots. A fun and easy recipe that’s also gluten-free and soy-free. 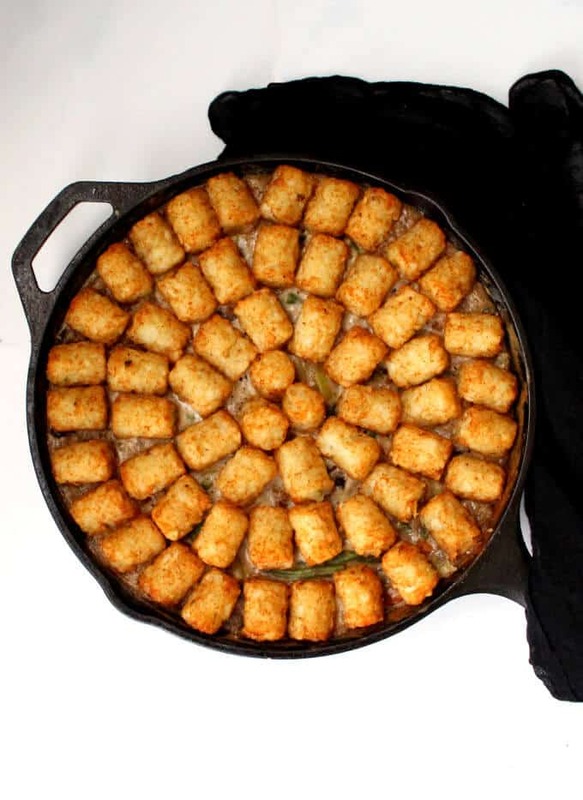 This vegan Tater Tot Casserole is guaranteed to thrill the child inside you but it’ll appeal just as much to the adult you are. All that praise for a recipe with mushrooms? Genius. And now for the adult. You know this is a one-pot dish because you read that right up there in the header, so you’re already going, easy cleanup! But there’s more. It’s a pretty easy dish to put together too. Almost all the ingredients come from the freezer so there’s minimal prep. The tiny amount of chopping and cooking that’s required takes no more than 15-20 minutes, tops. After that it’s the oven that does all the work for you while you relax and get a manicure. Or a pedicure. Or, if you’re not overly obsessed with the state of your digits, a nap. You could read a book too. Or watch TV. Point is, this is a breeze: easy prep, easy cooking, easy cleanup. 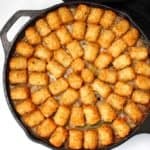 If you don’t have a cast-iron skillet, you can certainly use any other oven-safe skillet, or make the creamy filling in a skillet, pour it into a baking dish, and then top with tater tots before baking. 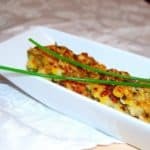 Tater tot casseroles enjoy a high degree of popularity in the upper Midwest, and especially in Minnesota, where a tater tot casserole recipe, known as hotdish, is something of a food staple. 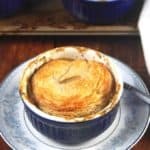 The story goes that the frugality of hotdish, and the fact that it combined starch, vegetable, and protein, secured its place as a popular family recipe during the Great Depression. I can totally see why. 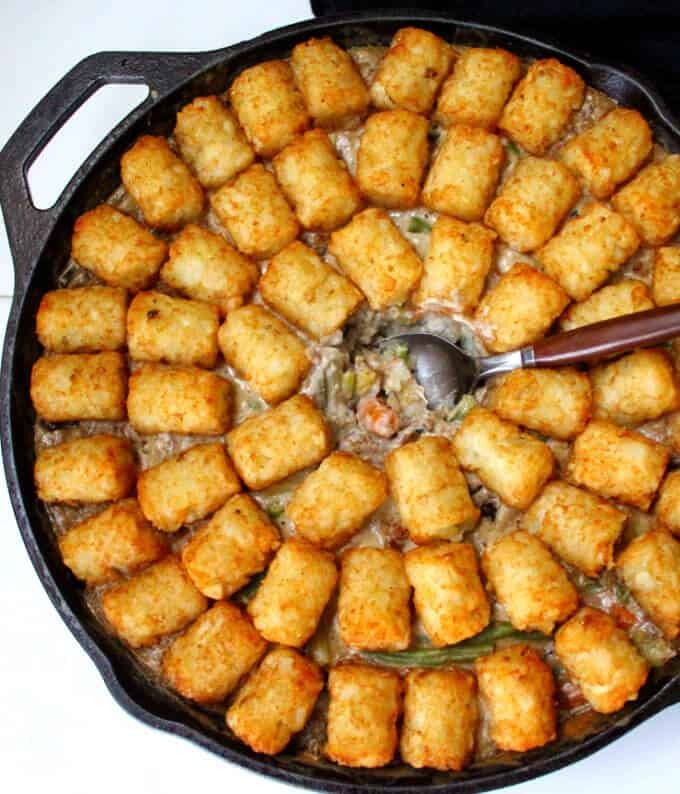 There are no exotic, expensive ingredients here, and although one couldn’t — and probably shouldn’t — argue that tater tots are healthy, the recipe in totality is pretty nutritious with just 227 calories per serving and more than 10 grams of protein from the cashews and vegan sausage. And here’s the best part for the cook, which I saved for the last, or probably not because you’ve already seen the photos. This is one gorgeous dish, and everyone will be rather impressed when you carry it to the dinner table and put it down. Be sure to do it with a tiny flourish. And no, you won’t get pronounced a genius by the James Beard Foundation, but you will certainly see lots of happy faces and hear many satisfied burps, and in the end isn’t that even better? 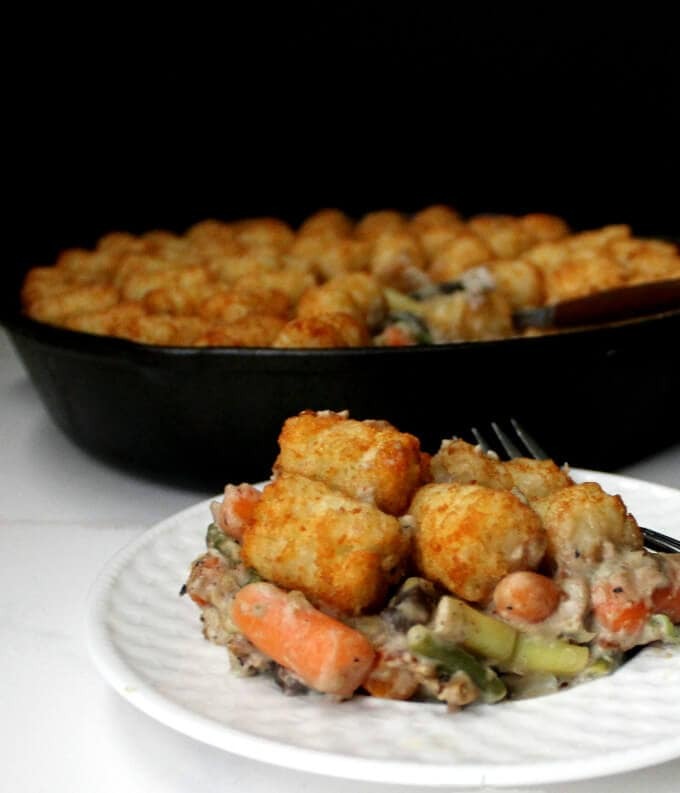 A one-pot vegan Tater Tot Casserole with a creamy, savory filling of veggies and vegan sausage covered by a golden, crispy layer of tater tots. A fun and easy recipe that's also gluten-free and soy-free. 6 Vegan sausage patties, crumbled or chopped Either Gardein or Morningstar is fine. 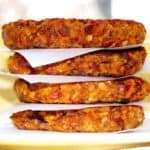 Morningstar makes vegan sausage and grain patties -- be sure to use that, and not the one in the green package that contains egg whites. 16 oz frozen veggies. I used a mix of green beans, wax beans and carrots. You can choose your own, including corn, green peas, and green peppers. Heat the oil in a 12-inch cast iron skillet. Add the garlic and onions, season with salt and ground black pepper, and cook over medium heat until soft but not brown. Add the sausage and stir for a couple of minutes until it starts to brown. Add the mushrooms and stir well. Saute for a few minutes until the mushrooms start to soften, then add the sage or thyme and the flour and mix well. Cook, stirring, for another couple of minutes. Add the frozen veggies, mix, and then add the nondairy milk. 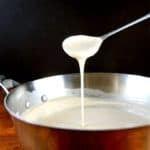 Stir frequently until the mixture just comes to a boil. Add more salt and pepper as needed. Turn off the heat. Arrange the frozen tater tots on top of the veggies. You can make a simple but appealing design, like I did, by arranging the tots in concentric circles. 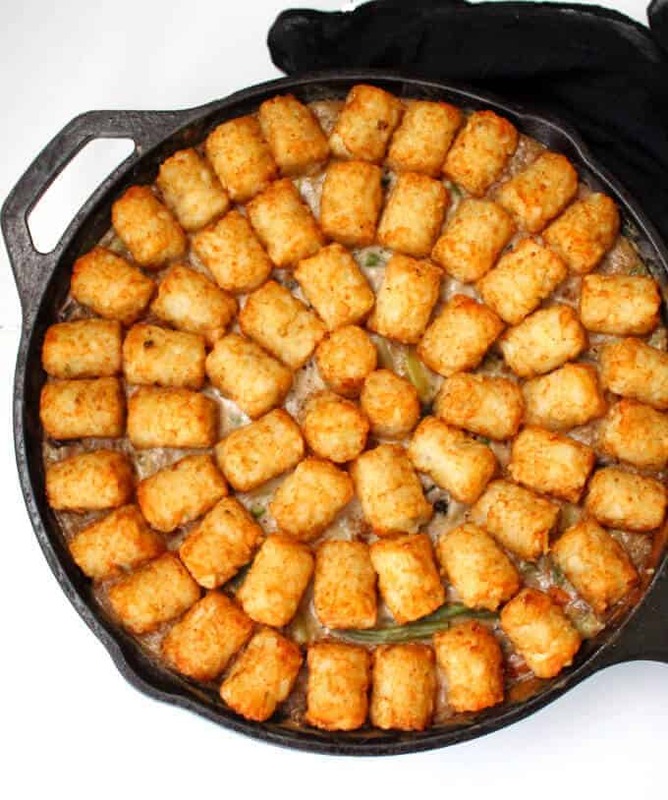 Place the skillet in the oven and bake 55 minutes or until the tater tots are golden-brown. Remove the skillet from the oven and let stand 5 minutes before serving. That is one gorgeous casserole! I have an 8 yr old and I think he will love this. It is so wonderful that you have so many healthy kid friendly recipes, and you even have a kid to try them on. 😉 I have made many of your recipes, including the veg biryani, for my family and everyone, including my son, have loved them. Hi Marie, so happy you’ve tried– and liked — those recipes. I think your son will love this– Jay, I swear, would eat all of it at one sitting if I would let him. You are reading my mind! 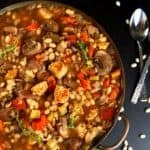 I was just wanting a nice vegan casserole and wondering if there were any “hot dish” versions out there. Thank you for this! 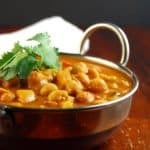 This was THE BEST vegan recipe I’ve made in a year!! Everyone in the family loved it, and wants me to make it again next week. Delicious. Thank you so much. You can freeze the filling separately, and then thaw, add on the tots and bake before serving. It has been a Holy Cow! week at my house. We made the Longevity Noodles, this Tater Tot casserole (although I didn’t have quite enough tots so used frozen fries on the last third of the casserole. They were good, too! ), and the South Indian Cabbage Dal. Thanks for keeping us fed and happy. 🙂 Miss you and hope you are well! I just want to note that if you say your recipe is gluten free, you may want to not put wheat flour as a recipe ingredient, or at least mention it can be substituted with a gluten free flour. 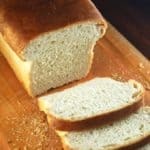 For those of us that often cook gluten free, it is easy to catch, but for less experienced family members or friends, it could make for a very unpleasant situation. Other than that, wonderful recipe! Rice flour is a perfectly good substitute for glutenfree eaters. I’ve added it in there. Cheers. If using fresh vegetables (I have unused green beans, corn, and baby carrots laying around), any recommendations on how to cook? This looks great btw. Hi Matt, fresh veggies will take a little longer to cook, so make sure they’re fork tender before you put them into the oven. Carrots would go first in the pan, followed by beans and then corn. 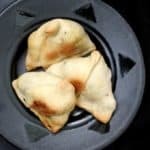 I just discovered this recipe and cannot wait to try it! However, I must let you and everyone else know that both Gardein & Morningstar Farms sausage products CONTAIN WHEAT GLUTEN. I have yet to find a meatless breakfast sausage that does not. The best vegan sausage I have found thus far is made by Beyond Meat, but they have yet to release a breakfast version. We made this for dinner tonight and absolutely loved it! We used cashew milk and it made for a nice and creamy base. This was delicious!!! I LOVE dairy but since being pregnant have realized I have an intolerance to it. 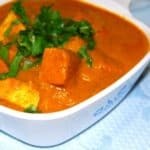 So I have been trying hard to find recipes I still love without the dairy and this one makes the VERY short list. My 2 year old daughter even loved it!